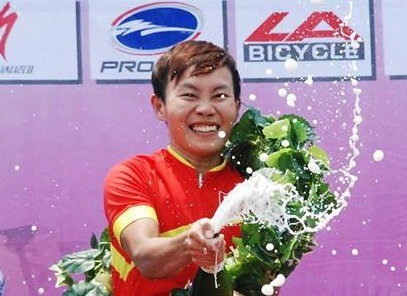 HÀ NỘI — Vietnamese Nguyễn Thị Thật earned her second stage win in a row at the Tour of Thailand yesterday. Thật was in the first group from the beginning and left behind strong rivals, such as Nuntana Supaksorn of the hosts, Meng Zhao Juan from Hong Kong, Saifutdinova Natalya of Kazakhstan and Fukuda Sae of Japan, to finish first in the 66km stage from Chiangmai to Doi Saket with a time of 1hr 49.08min. The tournament, which is one of the International Cycling Union’s events, included 63 participants from many countries. On Saturday, Thật won the 102km first stage from Chiangmai to Chom Thong. The Vietnamese holds both the yellow and green jersey after two stages.